The Council selected a developer, The Core Companies, to lead master planning and development of a six-acre site on Winchester Boulevard, near the Valley Fair and Santana Row shopping centers. 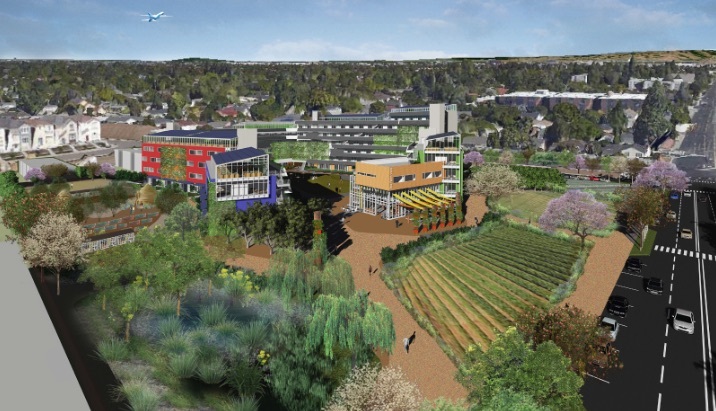 The project concept combines housing with several familiar elements: a small organic farm, community gardens, a children’s garden, California native plant edible landscaping, roof gardens, solar energy production, a farmer’s market, a rainwater garden, an outdoor kitchen, and much more. Overall, the project qualifies as an “agrihood,” a newer idea that focuses residential housing on a working farm, rather than a pool, tennis court or golf course. An agrihood also engages the residents in creating a sustainable food system for the entire community. This concept could be appealing to people of all ages, but the United States has only a short list of existing agrihoods (for examples: http://tinyurl.com/ox4to7h). The Santa Clara project appears to be the only agrihood in an intensely urban environment, and an exceptional showcase of several ideas in sustainable gardening. The City of Santa Clara selected this project among eight competing proposals because of its creativity, vigorous community support and the history of the site, which had been part of an agricultural research station operated by the University of California, beginning in the last 1950s. A visionary neighbor, Kirk Vartan, galvanized community support for this project. He found a creative and knowledgeable ally in Alrie Middlebrook, a landscape designer and leader of the California Native Garden Foundation, a non-profit group that demonstrates innovative gardening ideas and supports the development of school gardens. Middlebrook’s ideas are evident in the rich array of gardens in this agrihood, which has been called the Core/CNGF project. Agrihoods could become the evolutionary next step beyond community gardens and community-supported agriculture. Through this project in nearby Santa Clara, we can see the leading edge of innovative strategies for relating research-based gardening and community relationships. This entry was posted in Essays 2015, Fall Quarter and tagged California Native Plants, landscaping, Sustainability by tomkarwin. Bookmark the permalink.